(1) Good job on a hot long run last week. Although it cooled off a bit Sunday morning, it was still a run smack in the middle of a heat wave. About 15 or so showed up, some decked out in their favorite race shirts, and each of them powered through a tough run. (2) Thanks to Kristen for hosting the SLR BBQ last week. It was a great time. (3) I won’t be around Sunday morning, but Lois will get you all started and through another good run. 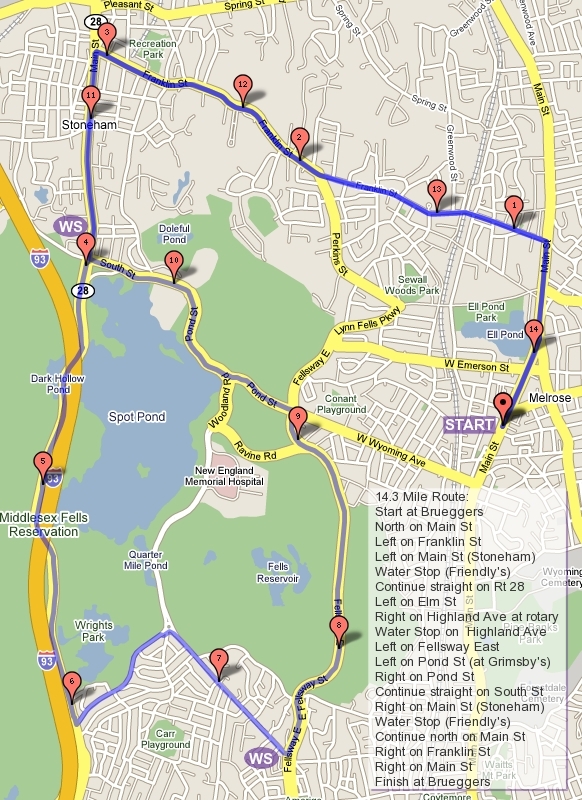 (4) The run this week is the rare running of the Horn Pond route. A summertime favorite not to be missed. Check the route maps for details. (5) The theme this week: Monochrome. When I ran my first marathon my mom asked what I would be wearing so she could spot me. My answer was “black shorts and a white singlet… like 20,000 other people”. So this week dress like a penguin, or like a police car, just keep it classically simple in your best Black & White, Ebony and Ivory, Salt and Pepper themed clothes. (7) Roll Call, who’s in for this week’s run? This week we’ll be following up the SLR with a BBQ to celebrate the Winter/Spring training seasons and the races that followed them. To further celebrate those races it’s Race Shirt Sunday. Wear your spring marathon or half race shirt if you did one. If you didn’t, or that shirt isn’t right for the summer weather, throw on your favorite race shirt and join us for a hot and steamy 10 mile long long run or a 10K shorter long run. The route: simple, run up Main Street to Nick’s Pizza in Wakefield. If you’re running short, turn around and run back to Brueggers. If you’re running long continue on Main to Lake Quannapowitt, run a counter-clockwise loop around the lake, then come back to Nick’s. Look at the map for more details. After revisiting the water stop keep on trucking down Main Street back to Brueggers. Winter SLR BBQ: Please post here to RSVP and tell us what you’re bringing. We’ll start the BBQ around 12. Kristen’s supplying burgers and dogs, you bring your favorite dish. The BBQ is at Kristen’s: 1 Stagecoach Lane (sometimes GPS show it as road), Lynnfield. Weather: It’s hot. Plan accordingly. Hydrate and dress for the temps. Last week we had a good group of 20 runners, most decked out in their club clothes for Singlet Saturday, run the first SLR of the season. This week we’ll be heading out to Spot Pond for a 7/12 mile long run. I won’t be around this weekend as I head down to New York City for the first time in my life (yes, I’ve never been to the Big Apple) to watch a Sox-Yankees game with my son. I’ll leave you in the responsible hands of Lois and Tom. As the Red Sox start up the second half of the season, the theme for this week is Sox Sunday. Wear something Sox-y, Red Sox gear, baseball cap, red socks, or just put on some red and white in honor of the home team. If you follow another team, feel free to wear that teams clothing (and be mocked). The route this week will leave Brueggers heading south towards Malden. Turn right onto West Wyoming and make your way to Grimsby’s. Turn left at the lights onto the Fellsway East. Roam over the hills down to a traffic circle at the intersection with Highland Ave. Turn right on Highland and follow it up towards Spot Pond, stopping at the water stop along the way. If you’re running short head right at the Highland rotary onto Woodland Rd on the Melrose side of Spot Pond. Continue to Pond Street where you’ll take a right and head back down to Grimsby’s. Turn left and follow the LynnFells Parkway past Melrose High School to Melrose Street where you’ll turn right and right again onto Main Street. Follow Main back to Brueggers and you’re done. Running long? Turn left at the Highland rotary onto Elm Street. Follow Elm to the end where you turn right onto Rte 28/Fellsway West. Continue up “slacker’s hill”, under I-93, over I-93, and over to the Straw Point parking lot at Spot Pond (just before the Friendly’s intersection). Look for a water stop in the parking lot, have a sip, and continue on along the pond past the Stone Zoo, all the way back to the Highland rotary. Run around the rotary and back to the water stop on Highland Ave.
From there you’ll continue a short way on Highland and take your first left on to East Border Road. Up that hill will bring you to a set of lights where you’ll turn left back on to the Fellsway East. Follow that past Grimsby’s onto the LynnFells Parkway. Go past Melrose High School, turn right on Melrose Street, and right on to Main Street. Main will bring you Brueggers where you’ll finish up. One more thing, next week, July 24th, we’ll follow up the Sunday Long Run with a Winter SLR Barbecue at the Dorsky’s house. Bring some sides and some things for the grill and we’ll celebrate what was done in the winter/spring. This replaces the SLR Brunch that never really takes place. If you ran in the winter reply with #Dorskying to let us know you’re coming. While we’re feeling the heat of summer, it’s time to start training for those long fall races. This week starts the Melrose Running Club Sunday Long Run Program… on Saturday. Yes, due to the fact the MRC Summer Party is Saturday night, and we don’t want a bunch of runners heading home early so they can get up to train in the morning, we’ll be running on Saturday morning instead. If you’re new to the SLR, click on the About link to the right for details on how this works. In a nutshell, look here after Thursday to see what the plan for the week is, reply and let me know you’re coming so I have enough waterstop supplies, memorize that week’s route, show up at Brueggers before 8AM on SLR day, give me a dollar if you’re running short, two if you running long, I’ll remind you where you’re running, run, see me or some other water stop volunteer along the way, finish, have a coffee and a bite to eat at Brueggers afterwards, chat with other runners, repeat each week. Brueggers has been kind enough to allow us to meet there for over 10 years now. Please be kind back,: stay clear of the service area, make way for their customers, keep your voices down, patronize their business, and don’t bring food in from their competitors. The route this week will be Farm Street for the long runners, Howard Street for the shorter route. Both start by heading north up Main Street past Ell Pond after which you’ll cross and bear right onto Green Street. At the intersection of Green and the LynnFells Parkway turn right at those lights onto the LynnFells. Follow straight along the LynnFells to the next set of lights where you’ll turn left on to Main Street in Saugus. This is where the two routes split. Running shorter, turn left at the first set of lights onto Howard Street. There we’ll have a small water stop for you. Take a quick sip and continue on Howard until you find the intersection with Green Street. Turn left on Green, follow that back to Main Street, and follow Main back to Brueggers, and you’re done! Running longer, continue on Main Street as it becomes Farm Street. You’ll look for a water stop on your right at Wakefield High School. After that stop you’ll continue on Farm Street to the end where you’ll turn left on Water Street. This will take you into Wakefield Center where you’ll turn left onto Main Street. Follow Main Street back to Melrose, back to Brueggers and you’re done! This season we’ll be introducing a theme to each run. Check in here to see what it is and we’ll see how many people are paying attention. This week’s is Singlet Saturday. Wear your running club singlet if you have one, be it Melrose or Mystic or Greater Lowell, or Somerville, or some other club. If you don’t have one, wear a purple or black singlet. If you have multiple running club, wear your Melrose one. This will give us a good sense of who’s from where.